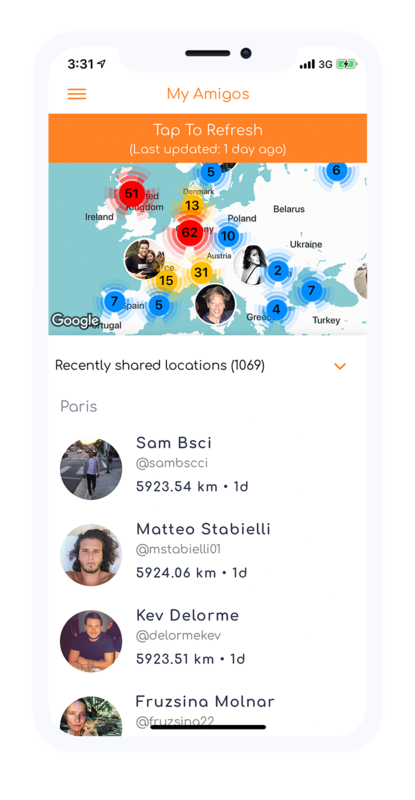 An Instagram map app that collects and maps public geotags shared by your friends, so you can keep track of where everyone is around the world! We only use publicly shared posts to build your map. Private posts remain private - always. Certainly. We do not ask for your password, so your account will remain 100% secure. If you ever share your Instagram password, you should be very careful! Our app is free to download, and we give every new user a number of free tokens to try out the service. After running out of tokens, they will be required to purchase more if they wish to retrieve updated geolocations. Can I get more free tokens? We are soon implementing a referral system where you'll be able to receive tokens in exchange for referring friends to download the My Amigos App. Yes of course! Any feature suggestions would be dearly appreciated as we're working hard to improve this app with regular updates. You can chat with us directly in the app from the Contact Us page.